Traditionally, managing distributed teams has been perceived as difficult. But the advent of effective modern processes and tools is breaking through the obstacles and making distributed teams a viable—and valuable—option. Find out how to make the most of people, processes, and tools to create and maintain a successful distributed team. Exploratory testers design and execute tests in the moment, starting with an open mission and investigating new ideas as they arise. But how do we know when to stop? The first step is to recognize that we can't know when we're done, because any approach to answering the stopping question is necessarily heuristic. Evolution of a word's meaning through common misuse is a reality of human communication. In the software industry, by using the phrase quality assurance to refer to what is more properly called quality control (i.e., testing), we may have lost our ability to answer the question "does our process work?" The requirements composition table is an effective technique comprising six steps that will help you assess an application's test coverage and identify gaps in your test suite even if you don't have any software requirements specifications. While some debate which, if any, industry practices deserve the designation "best practices," this tongue-in-cheek look at the horrors of some of software's "worst practices" drives home the value of the good ones and may help us improve the quality of our software. 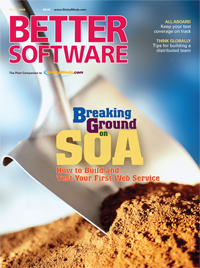 Web services are the foundation of today's service-oriented architecture. This article will teach you how to build a Web service from the ground up as well as how to test it using the three pillars of Web services testing—functional, performance, and interoperability tests. Software development has always been an exercise in managing complexity because there appears to be no end to the problems to which we can apply automatic computation. It has progressed as a discipline as good minds have created abstractions that transform that complexity into simplicity. Defining the work that belongs in your group and the work that doesn't belong can be challenging. A strong mission statement can help you defend your stance on what work you will and will not do, while ensuring you still provide the work your organization values.